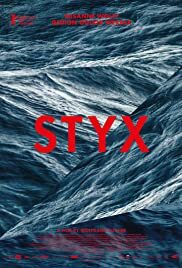 In Greek mythology STYX is the river that separates the human world from the underworld. Wolfgang Fischer’s second feature, STYX, begins with a well filmed night accident in Gibraltar where an emergency doctor comes to the rescue. This doctor is the film’s subject. Rike (Susanne Wolff) leaves for on a solo voyage across the Atlantic (reason not given). She decides to take on the high seas with her 12-metre yacht but gets more then she bargained for. She encounters a monster storm followed by a mammoth human decision on a moral scale as to what to do when she encounters a sinking refugee ship. Not much story and with minimal dialogue so that the film lags a little, but still occasionally full of emotional impact, STYX is magnificently shot with stunning cinematography by Benedict Neuenfelsthat that will leave one spellbound. The night storm scene demands mention.